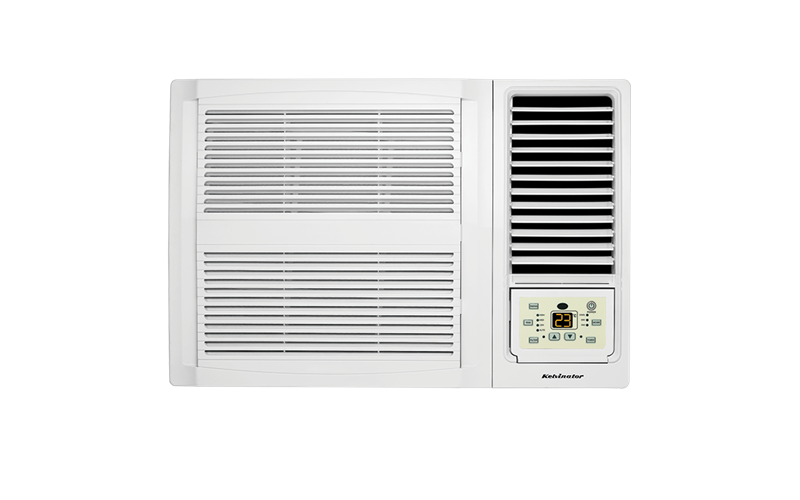 Window Wall Cooling Only Air Conditioner 2.7kW is rated 4.7 out of 5 by 49. Rated 5 out of 5 by dreilly from Excellent power consumption and fantastic cooling Got one of these for my mum, when the compressor is running it draws a bit over 80 watts, and keeps her room at whatever temperature she likes. Put a meter on this unit and during summer time with average to large usage you are looking at roughly 5-7 bucks per week to run it (calculated at 24c per KW). Rated 5 out of 5 by Rex7423 from Just chillin'! I bought this yesterday to use in an average size bedroom (9.52 square meters) and it sure does the job very well. Rated 4 out of 5 by Miss Matilda from Fitted perfectly Our purchase of the new Kelvinator for our demountable office has made for a much happier office. Rated 5 out of 5 by Lola16 from Excellent Very happy with this unit, perfect for the room, very quiet, very handy remote control to set timer and most of all it keeps me sooooo cool. Rated 5 out of 5 by Jovilo from A well-designed unit with simple to use controls. I searched several stores for this type of air conditioner to suit my budget and planned installation area. The unit is operating in an climate of hot and humid weather in summer and is very efficient in de-humidifying the rooms for which it is installed. The effectiveness and cost of the unit are greater than the expected outcome which is an added bonus. I recommended the air conditioner to a friend who immediately purchased a unit. Rated 5 out of 5 by Angelzblog from So Quiet! This machine is so quiet compared to our 20-odd year old unit. So very, very happy with the performance and price that we are considering buying a second one. Cheapest around too! Rated 5 out of 5 by justme632000 from Lovely and cool I bought this Kelvinator just over a month ago and after removing my old one, it took me about 10mins to unpack, remove the outer casing and get it into the bedroom. The outer casing fitted into the existing slot and with minor adjustments around the outer casing it was just a matter of sliding the unit into the casing, securing the screws and plugging it in and turning it on, wow took me about 1and a half hours to start getting cool and boy its so quiet running and cools very quickly.